ZTP › Rottweiler Klub of North America Inc. The Ztp (Zuchttauglichkeitsprüfung) is designed to select those Rottweilers who are worthy of being bred. The dog’s conformation must be judged of breeding quality and free of disqualifying faults. The dog must have a passing hip and elbow rating have been tested for JLPP (OFA, ADRK or other), a BH degree and permanent identification (tattoo or microchip). Once the conformation and soundness qualifications have been met, the dog’s temperament is tested. This test includes a gun sureness test, a protection test, and a test to ensure the dog is stable around the public. 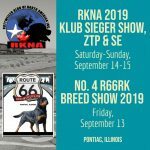 The Rottweiler Klub of North America Inc. strongly believes that these tests are vital to maintaining the Rottweiler in type and temperament and should be the foundation of any breeding program. Keep in mind it’s not about to evaluate the training, it’s about to test the working ability and temperament of the dog.